One of our key areas of focus is the integration of natural capital into business decision-making and natural capital accounting into businesses. This week, we interviewed Amy Larkin, the author of Environmental Debt: The Hidden Costs of a Changing Global Economy to hear her perspective on the need to account for all costs – especially the environmental ones – of doing business and the opportunities for businesses to transition to more sustainable and long-term economic models. Tell us about the background to this book, why did you choose to write about our environmental debt and what do you wish to accomplish through your work? 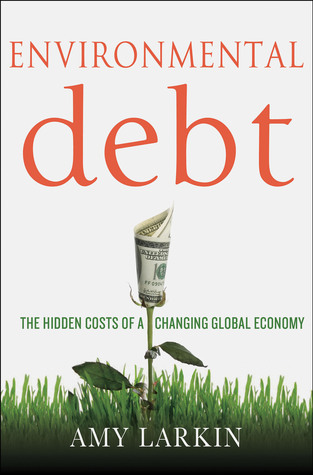 This book explores the connection between the financial and environmental crisis, which are closely correlated. In 2009 I wanted to understand a truer cost of a KWH of energy sourced from coal – which included externalities such as environmental impacts, cleanup costs, health-care impacts and other related costs, etc. At the time I was with Greenpeace and I collaborated with experts from Harvard to analyze these costs. According to the in-depth study born out of this collaboration, the external costs of coal are more than double the current market price for this source of energy – if we incorporate the broader costs. The externalities produced by the coal industry generate about $350 billion in the US alone. In fact, there are similar studies to the Harvard case that focus on the externalities of oil. Adding up costs that stem from both industries exceed the 2012 United States government budget deficit. This problem is not unique to the situation in the US. Recently, officials in China stated that the costs of environmental degradation amount to 3.5% of GDP. Financial and environmental debt are interlinked. In writing this book I hope to inform the debate on energy, business, and financial policies, to incorporate the real costs of our public and private expenditures. All money is not created equal. Allocation of funds to R&D that spurs 21st century clean energy industries, education that provides training and workforce strength, or public transport that becomes a great alternative to private cars all provide benefits for generations. Health care for treating respiratory ailments caused by air pollution or chemically-caused childhood cancers, water treatment to eliminate chemicals, or educational systems that have inordinate amounts of developmental disabilities are dollars no one wants to spend….they represent the public version of stranded assets. In my book, I connect the causes and solutions of both the financial and environmental crises and ultimately, establish the connection between true costs versus actual prices. That is the debate we must begin. In your opinion, how could we achieve the ideal scenario of natural capital management, and who should play the role in getting us there? In my book I outline three principles that define a framework for business policy: pollution can no longer be free nor subsidized; the long view must guide all business decision making and accounting practices; and government must catalyze and vitalize new technology, reward businesses that are moving in the right direction, while penalizing dirty technologies and practices. Governments have the role to help us transition, while businesses have the skill and scale to adapt to the transition. How do we engage business more in tackling this challenge? A lot of companies are in fact already engaged – for example – attending climate change negotiations and supporting pricing schemes on carbon. Extreme weather and polluted and constrained resources are altering many companies’ views on the real costs of pollution. When you cannot predict your bottom line, it’s harder to protect your stock price as well as your job. There are other businesses especially those in the fossil fuel and chemical industries that are fighting against a new price paradigm. There is in fact a growing fissure in the business world. We need to move towards different models of doing business where pollution is priced and businesses are rewarded for making transformative change. I believe we can get there. Many executives state that if they had accounting and business measures that count investments differently, tax credits and various instruments, capital investments would be made differently and businesses would quickly adapt. I believe we can make it. Sharing Amy’s goals, at B. Accountability we also aspire to contribute to accelerating at the implementation of least one of the principles required for a successful transition. In our engagements, we not only work with business on the long-term considerations for natural capital, but also, advise governments on potential opportunities for a more effective management and valuation of the natural capital we depend on for business growth, and essentially, for survival. We are pleased that we can share ideas with forward thinking individuals such as Amy.